The American vehicle was a true workhorse of World War II. The U.S. Army’s quarter-ton, four-wheel-drive Willys-Overland and Ford jeep was rugged, reliable, and highly maneuverable and gave sterling service in all theaters of operation during the 1939-1945 war. Praised by everyone from generals to privates, it was used for myriad tasks in all conditions of weather, from deserts to mountains, from jungles to beachheads. The jeep could be pulled out of the mud by its riders, was flown in gliders, and was easily adapted for an amphibious role. From Bizerte to Saipan, from Rangoon to Anzio, and from St.-Lo to Bastogne and beyond, jeeps were utilized fully by American troops and their British Commonwealth, Free French, and Polish allies. The jeep was the most recognizable and widely used military vehicle in history, and the one the Germans most liked to capture in World War II for day-to-day use. Interviewing Wehrmacht generals after their surrender, U.S. Army historian Hugh Cole said that they admired the jeep more than anything else in the formidable American arsenal. Although the U.S. and British Armies had used Ford Model T cars in World War I, the U.S. Army was still primarily horse-drawn in the 1920s and early 1930s. But there was a growing realization in the Quartermaster Corps and the Ordnance Department of the need for motorization as soon as possible, and the Army had a standing requirement for a small motor vehicle. In 1932, the Infantry Board recommended acquiring some British-made, two-seater Austin Seven roadsters with oversize tires for use in reconnaissance and messenger duties (the Austin Seven would be used extensively by four armies as a radio and liaison vehicle). The U.S. Army was already experimenting in the early 1930s with motorcycles for such roles, but they had limitations in cross-country service. Motorcycles were too noisy for reconnaissance work and were more accident prone in rough terrain than four-wheel vehicles. The Army sought a practical way to move machine guns and light weapons around a battlefield, so in 1936, the commandant of the Infantry School at Fort Benning, Georgia, ordered the construction of a motorized machine-gun carrier with a one- or two-man crew. The Howie machine-gun carrier was developed under the direction of Major Robert G. Howie of the school’s tank section and was completed in April 1937. But the crew had to lie prone to reduce the silhouette of the low-slung vehicle, nicknamed the “Belly Flopper.” It proved generally impractical but came to be regarded as the grandfather of the famous World War II jeep. The Army began to consider in the late 1930s whether one-and-a-half-ton cargo and pickup trucks would be suitable for light battlefield roles, but the Infantry Board wanted a small four-by-four, 1,000-pound vehicle to improve the mobility of a battalion’s heavy weapons company and to provide transportation for company and platoon leaders. When American Bantam Co. of Butler, Pennsylvania, loaned three Austin Sevens to the Pennsylvania National Guard for evaluation during its 1938 summer maneuvers, Charles Payne, who oversaw Bantam sales to the Army, suggested that there was a considerable potential for a special reconnaissance vehicle based on the British roadster. Payne’s idea interested technical experts in the Quartermaster Corps, and they laid down requirements for the project in June 1940. The Army General Staff then handed the responsibility over to the Ordnance Technical Committee, and a subcommittee began work on the project on June 19, starting with a meeting at the Bantam factory. The subcommittee included Major Howie and three Ordnance Department engineers, Bob Brown, Bill Burgan, and William Beasley, who advised the Technical Committee and potential manufacturers on basic requirements for the vehicle. They said it should have four-wheel drive and a crew of three, and mount a .30-caliber Browning machine gun. The focus of the development of the new reconnaissance car was the Bantam plant, where engineer Karl K. Probst headed the project, and the Quartermaster Corps depot at Camp Holabird in Baltimore, Maryland. The talented Probst was eventually regarded as the father of the jeep, but the vehicle was actually a joint effort. Bantam shopped around for suitable components while engineers at Holabird drew up the basic configuration of the vehicle. Bids were invited in July 1940. Out of 135 manufacturers contacted, only two submitted bids. They were American Bantam Co. and Willys-Overland Co. of Toledo, Ohio. The latter had been trying to interest the Army in considering some of its light vehicles. The first contract went out on July 25, 1940, to Bantam for the construction of 70 quarter-ton reconnaissance cars, with the first model to be delivered to Camp Holabird in 49 days. The vehicle was tested rigorously in the fall of 1940. It performed well, though numerous improvements were needed. The Quartermaster Corps now considered standardization and full-scale production, and competitive bids were issued. Three companies showing an interest were Bantam, Willys, and Ford Motor Co. The QMC was concerned whether Bantam could handle a big Army contract because it had only a small plant with fewer than 500 workers. Ford, meanwhile, boasted 100,000 employees and several plants. Furthermore, Bantam and Willys were in shaky financial condition in the aftermath of the Great Depression. While war now raged in Europe, squabbles and controversy delayed production of the Army’s reconnaissance car. Bantam officials complained to Secretary of War Henry L. Stimson that they should be given credit for the development of the vehicle and protested the involvement of other firms. Army officials disagreed and pointed to Camp Holabird’s role in the vehicle’s origins. Army agencies met in mid-October 1940 to iron out problems, and a consensus was reached that 1,500 more vehicles should be purchased for further trials. The Infantry Board and the Army combat arms were satisfied with Bantam’s work on the reconnaissance car and did not favor bringing in other manufacturers, but the QMC sought to split the order for 1,500 vehicles two or three ways because it saw a requirement for 11,800 further cars through mid-1941. It doubted that Bantam could tool up quickly enough for such a major contract. The fight over future production raged in Washington for several months. A corpsman holds a plasma bottle and rides beside a wounded man aboard an ambulance jeep on Okinawa in the spring of 1945. Although the ambulance jeep was used on all fronts, it gained a reputation for being somewhat unstable on narrow, mountainous roads. The Army General Staff supported the infantry viewpoint and recommended a sole-source contract to Bantam. The Defense Commission (later known as the Office of Production Management) backed the QMC position that multiple manufacturing sources were necessary. A compromise was finally reached in November 1941, with three contracts awarded to the three competitors for 1,500 vehicles each. The controversy intensified that same month when several magazines began charging that the Army was favoring the giant, Ford, over the underdog, Bantam. This sparked calls for a Congressional inquiry. Pilot models of the reconnaissance car were delivered to Camp Holabird for trials, and a production run followed. The Ford design was nicknamed the Pygmy, while the Willys model was originally called the Quad. Extensive cross-country testing continued at Camp Holabird and Fort Benning. The Willys vehicle was overweight compared to the Bantam and Ford entries because of its four-cylinder, 55-horsepower “Go-Devil” engine and heavier transmission. This distinguished the Willys design from its competitors, but, in order to avoid losing its contract, the Ohio company redesigned the Quad and reduced its weight. The definitive Ford model was called the Ford GP. The Army’s overriding concern was to have a single quarter-ton truck design rather than three separate types, and the wrangling continued. The Quartermaster Corps continued to favor Ford, which made a critical concession in the late summer of 1941 by offering to manufacture its quarter-ton truck on the basis of the Willys design. The QMC expanded production to Ford. Early production models of the quarter-ton truck rolled off the assembly lines, and the demand grew after the signing of the Lend-Lease Act whereby neutral America assisted its warring, hard-pressed allies. A number of the vehicles were shipped to Great Britain and the Soviet Union, and there was interest in much larger supplies. Eventually, about 2,675 Bantam, 3,650 Ford, and 1,500 Willys jeeps were passed to Britain and Russia as part of the Lend-Lease program. The smallest of the U.S. Army’s trucks, the standard jeep had remarkable power, stamina, and maneuverability. It was 11 feet long and 4 feet high and had a maximum highway speed of 50 miles per hour. It could carry five soldiers or 800 pounds of cargo, and, when fully loaded, covered 20 miles on a gallon of gasoline. Besides troops, the jeep would be called upon to haul ammunition, medical supplies, rations, and communications gear and was capable of towing small artillery pieces or even some types of small aircraft. Special fittings enabled the jeep to serve as a machine-gun platform, ambulance, firefighting vehicle, or radio patrol car. The little vehicle towed supply trailers and 37mm antitank guns and could mount all types of machine guns, recoil-less rifles, Wasp flamethrowers, and both bazookas and multitube rocket launchers. It also carried forward artillery observers and was used to lay telephone cables. The jeep could cross bridges too weak to support heavier vehicles, was easily transported by air in American Waco and British Horsa gliders, and could be dropped by parachute. The vehicle was sometimes modified to provide motive power on railways and could traverse all types of terrain. Armor was added to some jeeps for “shoot-and-scoot” operations, and amphibian jeeps (seeps) were to see service in the 1942-1943 North African campaign and with Soviet Army reconnaissance units on the Eastern Front. Many variants of the jeep were developed during the war. The Canadian Army Proving Establishment in Ontario built a tracked jeep in the autumn of 1942; a six-wheel “Super Jeep” was developed for the U.S. Army as a personnel carrier or field ambulance, but it never entered production; and a lengthened armored-car “Super Jeep,” also with six wheels, was tested in 1942 for the Army’s Tank Destroyer Command. The program was terminated. The most bizarre variant, however, was the ungainly, rotor-powered British “Rotabuggy” flying jeep. Towed by an Armstrong Whitworth twin-engine bomber, the Rotabuggy was developed for the British airborne forces, but the increased use of Horsa and Waco gliders made the program unnecessary. An estimated total of 653,568 jeeps—standard and modified—were produced by the time the war ended in 1945. The majority were built by Willys-Overland. A number of theories surfaced about the origin of the vehicle’s name. Before its universal acceptance, manufacturers and the press came up with such names as Peep, Bug, Midget, and Quad, while the British dubbed it the Blitz Buggy. Amphibious and winterized versions were known as the Quack and Penguin. Many people believed the name was derived from the official designation of “GP” (general purpose). The term “jeep” had been around for many years—an Army slang word for anything that was insignificant, awkward, or silly. “Jeepy” meant foolish. Army mechanics in World War I called any new vehicle a jeep, while in the Army of the 1930s the term referred to a recruit. The name became more popular in September 1937 with the arrival of the cartoon character Eugene the Jeep in Elzie C. Segar’s syndicated Popeye comic strip. Eugene resembled a dog, came from Africa, and enjoyed a diet of orchids. The name was used by Irving “Red” Hausmann, a Willys-Overland test driver, during trials at Camp Holabird to distinguish his company’s vehicle from its Bantam and Ford competitors. When the Washington Daily News ran a story in February 1941 about the Army’s new quarter-ton truck, the name jeep caught the public eye and stuck. The jeep served in every theater of war and became a byword for mobility and reliability. It was employed for every conceivable military purpose compatible with its size. In rear areas, it was used widely for messenger and light cargo duties, as a staff car, and as transport for military police and Navy shore patrol units. The use of jeeps increased dramatically through 1942 as America and its allies went on the offensive against the German, Italian, and Japanese foes. 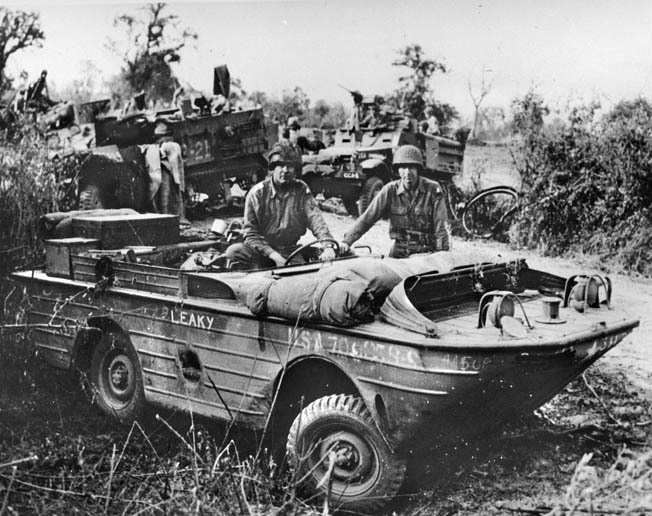 Jeeps struggled through swamps and jungle as U.S. 1st Marine Division and Army soldiers fought a six-month battle to secure Guadalcanal in the Solomon Islands, and Australian troops used the vehicles to negotiate the forbidding terrain of New Guinea. In the Mediterranean theater, jeeps rolled through the dust of Algeria, Morocco, and Tunisia after the Allied invasion of North Africa in November 1942. In the Western Desert, meanwhile, jeeps laden with jerry cans, ammunition, rations, and Vickers K and .50-caliber Browning machine guns carried men of the legendary British Long-Range Desert Group and the Special Air Service as they made hit-and-run raids on airfields, supply dumps, and communications lines behind the lines of Field Marshal Erwin Rommel’s vaunted Afrika Korps. After the launching of Operation Husky in July 1943, jeeps toiled up and down the scrubby ridges of mountainous Sicily with the British Eighth and U.S. Seventh Armies. Then, the stalwart little trucks traversed the muddy trails and crags of mainland Italy as the Eighth and Fifth armies fought a bitter, two-year struggle against Field Marshal Albert Kesselring’s German armies. Lt. Gen. Mark W. Clark, the rangy, flamboyant commander of the Allied Fifth Army, rode in a jeep when British, American, and Free French forces rolled into Rome on June 4, 1944. After the British, U.S., Canadian, Free French, and Polish assault divisions landed on five Normandy beaches early on June 6, 1944, jeeps were widely used under several national colors. The Americans rode them during the July breakout from the beachheads while the British and Canadian Armies, battling the bulk of German panzer strength in the Caen area, used them as ambulances. SAS and French Resistance units raced in them behind enemy lines in Normandy. Lt. Gen. Jacques Philippe Leclerc rode in a jeep when he led his proud French 2nd Armored Division into Paris on August 25, 1944. General Bernard L. Montgomery, commander of the powerful British 21st Army Group, sometimes chose the vehicle over a Humber staff car or his office trailer. Lt. Gen. George S. Patton Jr. occasionally rode in a customized Willys-Overland jeep in North Africa, Sicily, and as his freewheeling U.S. Third Army pushed toward the River Rhine. In Normandy, before his untimely death, Brig. Gen. Theodore Roosevelt, Jr., feisty assistant commander of the U.S. 4th Infantry Division, used a battered jeep bearing the name Rough Rider, in honor of his famous father’s Spanish-American War cavalry regiment. Jeeps were air-dropped with the Allied airborne divisions in Operation Market-Garden on September 17, 1944, and the robust little vehicles hauled 6-pounder antitank guns when men of the British 1st Airborne Division marched into Arnhem, Holland, for their valiant, doomed stand at the “bridge too far.” In 1944, infantry glider regiments were equipped with 24 jeeps, while parachute regiments had 17. On many U.S. and British airfields in England, meanwhile, radio-mounting jeeps were used extensively for runway control, towing, and guard duties. 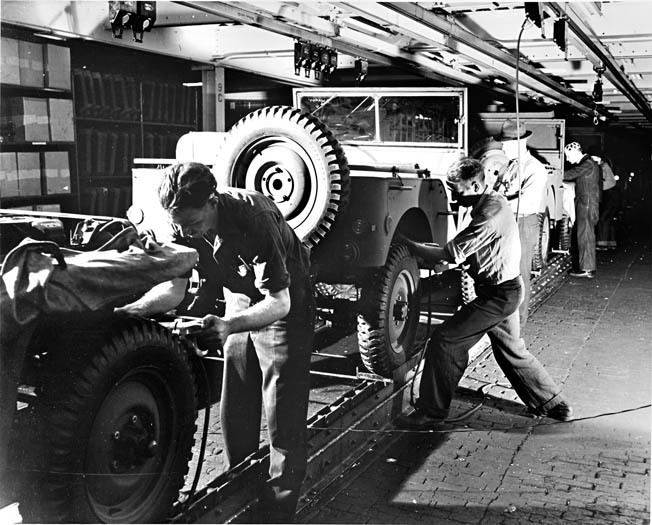 At the Willy’s plant in Toledo, Ohio, assembly line workers complete the manufacture of jeeps in 1941. Armored and lengthened jeeps and others improvised as snowplows served in besieged Bastogne and elsewhere in the Ardennes after the German breakthrough on December 16, 1944. Jeeps were in the thick of the fighting as Patton’s Third Army and British units stabilized the critical situation in the Bulge, and they rolled across the Rhine with British, American, and Canadian armored, infantry, and artillery formations in the early spring of 1945. Thousands of miles to the east, jeeps were in the forefront and performing a multitude of tasks as British Commonwealth and American forces cleared the Japanese from Burma, China, and numerous island groups across the Pacific. From fetid Guadalcanal to the black sands of Iwo Jima and arid Okinawa, jeeps were relied on and highly valued by thousands of U.S. Marine Corps, Army, Navy, Army Air Forces, and Coast Guard personnel, from privates and seamen to generals and admirals. Jeeps were still in wide use after the Germans and Japanese were vanquished in May and September 1945, respectively. They carried military police units in Berlin, Tokyo, and Paris; U.S. Constabulary personnel in occupied Germany; and combined British-U.S.-French-Soviet MP patrols in Vienna. Late in the war, jeeps were used by the British, American, and International Red Cross when the Nazi concentration camps were being liberated in Germany, Poland, Austria, and Russia. World War II jeeps were featured in Bill Mauldin’s popular, widely syndicated Willie and Joe cartoons, and the vehicle was revered by all who served in World War II. It was one of the most widely used and dependable pieces of ground warfare equipment in the Allied arsenal, along with the American Garand M-1 infantry rifle, Sherman medium tank, and bazooka rocket launcher; the British universal carrier, 25-pounder field gun, and 6-pounder antitank gun; and the Russian T-34 medium tank. 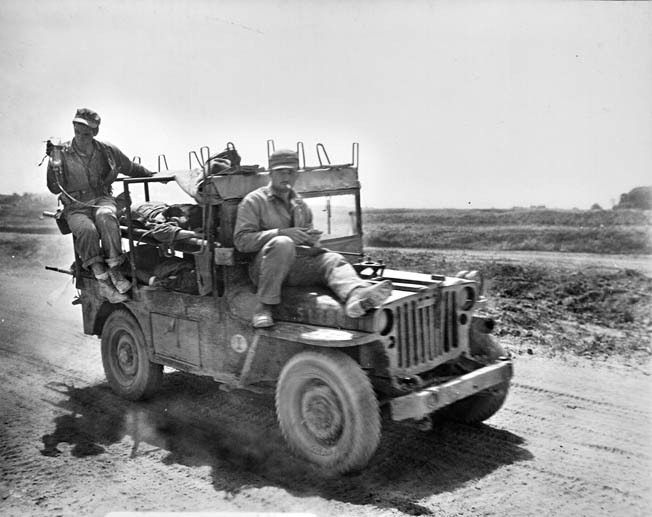 Standard and modified jeeps were widely used later by Allied forces in the 1950-1953 Korean War; by the French in Algeria and Vietnam; by British and French troops in the abortive 1956 Suez Canal action; by United Nations truce patrols in Cyprus; by Israeli forces in Egypt and Sinai in the 1960s and 1970s, and by U.S. Army and Marine Corps units in Lebanon and Grenada. Tags Albert Kesselring, Allies, Bantam, Bastogne, Battle of Saipan, Battle of the Bulge, Bill Mauldin, Britain, Ernie Pyle, Ford Motor Company, Free French Army, General George C. Marshall, General George S. Patton, Henry L. Stimson, Invasion of Sicily, Jeep, Korean War, Lend Lease Act, Mark W. Clark, Mediterranean, military jeep history, Okinawa, Operation Market-Garden, Sicily, Soviet Union, Theodore Roosevelt Jr, U.S. Army, U.S. Navy, U.S. Third Army, Willys-Overland.